As soon as the existence of a new Indonesian orangutan species was confirmed by scientists in 2017, it became clear that all 800 individuals are in immediate and long-term danger from a major project to build the island of Sumatra’s largest hydroelectric dam. The dam builder, PT North Sumatra Hydro Energy, backed in part by the Bank of China, is moving quickly to clear significant areas within the pristine forest home of the newly discovered so-called Tapanuli orangutan. The area affected is a steep river valley between North Sumatra’s Batang Toru ecosystem and Dolok Sibual-buali Nature Reserve to the south. “It’s in the worst possible location,” says Matthew Nowak, director of biodiversity monitoring for the PanEco Foundation’s Sumatran Orangutan Conservation Programme, noting that the clearance—and associated roads, infrastructure, and powerlines—will further isolate Tapanuli orangutan groups fragmented between three forest blocks and divide the most viable group. “A new corridor is urgently needed to connect the western and eastern populations of the first new species of great ape to be identified in nearly 100 years,” he says. The 510-megawatt dam will permanently segregate the remaining, largely tree-dwelling apes, preventing individuals from reaching one another for reproduction and thus reducing gene flow between subpopulations—a significant barrier to the species’ long-term genetic viability. The red, frizzy-haired species, whose Latin name is Pongo tapanuliensis, is already listed by the International Union for Conservation of Nature as critically endangered, based on an estimate that, without significant action to protect its habitat, in three generations, the population will have dropped from some 1,489 individuals in 1985 to 257 in 2060—a decline of 83 percent. According to PanEco scientists, the North Sumatran provincial government has on several occasions publicly declared that the province has a surplus of energy, and there is speculation that the dam’s construction is motivated by the energy needs of a large-scale local goldmine. “Other, more environmentally friendly, energy-generating options are available, rather than pushing the most endangered great ape in the world towards extinction for some 500 megawatts of energy,” says Gabriella Fredriksson, Tapanuli programme manager for PanEco. Potential alternatives to the dam include increasing the output of a large geothermal plant that already exists in the area or building a lower impact hydrodam instead. Although the dam itself is not yet under construction, the developers have already been granted permits to build an 8-mile, 11-yard diameter tunnel through primary rainforest along the river valley, and have opened an access road—guarded by armed forces—along its length, clearing forests as they went. 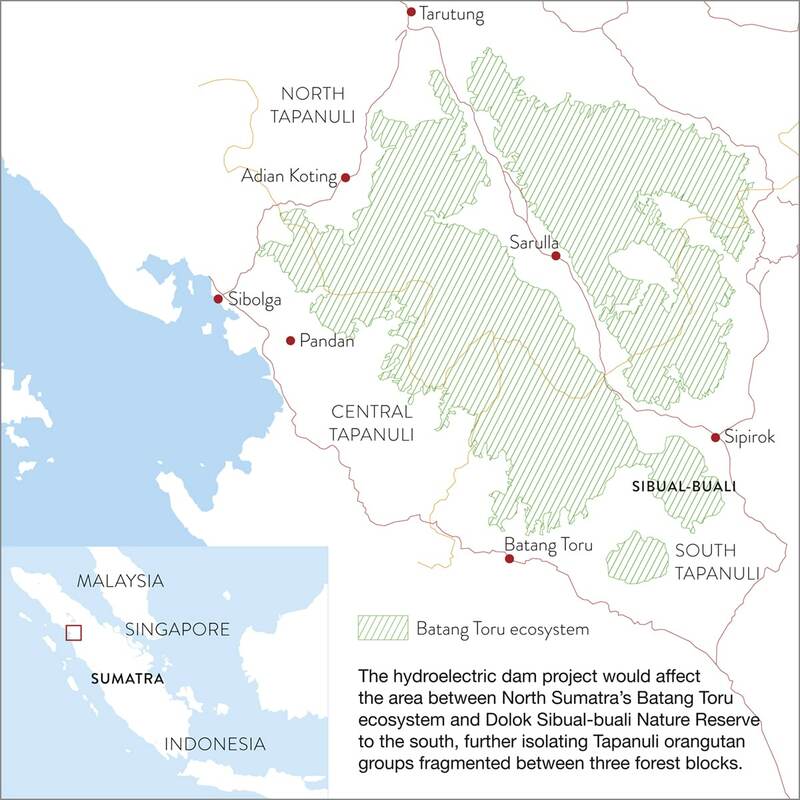 Although 85 percent of the 545-square-mile Batang Toru ecosystem—in North Sumatra’s Tapanuli region—has been protected since 2014, the planned dam lies within 15 percent that remains unprotected. PanEco believes that these remaining areas should also be protected, because—due to their steep slopes, highly erodible soil, and high intensity of rainfall—they meet the government’s own conservation criteria, outlined in national spatial planning regulations. According to PanEco, a small-scale environmental impact study, required of the company by the government, ignored the dam’s potential impact on wildlife, failed to mention its location in a major earthquake zone, or note the effects of potential floods and water shortages, and of the dam itself, on local people and their livelihoods from fishing and agriculture. Tapanuli orangutans also face significant threats beyond the dam project, particularly from subsistence and migrant farmers—who have little awareness of the species’ habitat or protected forest boundaries—moving from the surrounding deforested lowlands up to the fringes of the rainforest, and even deep inside it. Deforestation in this remote forest is less severe than in the better known Leuser ecosystem about 60 miles north, home to the remaining six or seven thousand-member population of Sumatra’s other orangutan species, Pongo abelii. However, during recent decades the Tapanuli population has been driven into hard-to-access highlands, and fragmented into a western block of fewer than 600 individuals, an eastern block of under 200, and a southern segment of under 50 in the Sibual-buali reserve area. The long loud booming call by a large adult male named Togos, 90 feet up in the Batang Toru canopy, had a higher maximum frequency range than scientists were accustomed to hearing from the Sumatran orangutan, and a longer duration, with more pulses, than its Bornean cousin, Pongo pygmaeus. “His scream was a key clue,” says Nowak, of the roar heard periodically from early morning to afternoon, from up to half a mile away, to let both males and females know that this ape—about 25 years old with large, flat, white cheeks and long frizzy hair—was in the area. The Tapanuli also stood out as genetically different, says Ian Singleton, PanEco conservation director and director of the Sumatran Orangutan Conservation Programme, who carried out widespread surveys of orangutans in the 1990s. * Learn more about the threats posed to ape populations by industrial infrastructure at: stateoftheapes.com.